It is important for children to know that they can talk to God about anything and that He will listen. When a child prays to God about a sick pet or a scary “monster” I am reminded that my Heavenly Father also listens to my heartfelt prayers and cares about my concerns and fears. Talking to God. If we speak to someone who is standing on the other side of a curtain we cannot see them but they are still there. God is listening to us even though we cannot see Him. Praise. We express praise to Him for His unique and wonderful qualities. We like to hear people praise us and God likes to hear us praise him. Thankfulness. In prayer we voice appreciation to our Father for what he has done for others and for us. Confession. Prayer is a time when we can tell God that we are sorry for sins we have committed or for things we should have done that we did not. Making Requests on Behalf of Others. Children can pray for the sick or hurting. They can pray for the gospel to be preached to unsaved people. They can pray for adults they know or have heard about. Making Personal Requests. In prayer we ask God to forgive us for sin, help us to do better or do good, give us strength when we are weak or even just share our feelings with Him. People they have heard adults talk about. People who are mentioned in church announcements in the church bulletin. Sick people that they may get well. When we ask someone to pray for us we do not necessarily want everyone else to know about that prayer request. It is important to treat a child with the same respect. As a teacher you will sometimes hear a child pray for matters that are private to that child’s family. If appropriate you might wish to talk to the parent(s) about it but never gossip about it to others. 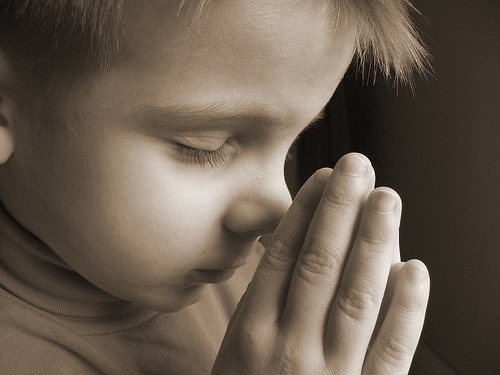 Sometimes children are not focused on God when they pray in class. They may be silly or try to make jokes in the prayer. If a child prays an inappropriate prayer I generally say something like “Our God is the Creator of the universe. He is stronger than the strongest person on earth. He loved us so much that he sent his son to die for each of us. Next time we pray let’s give him our respect.” Then move on and don’t dwell on it. I’ve got something different in my plans for you. There is no formal structure of prayer that we must pray in every situation. To help children learn to pray I often use the following general outline that I found on the back of a poster from TREND. The teacher can even write out these sentences and let the children fill in the blanks for a written prayer. This is often one of the first ways a young child learns to pray. The teacher should ask the children to fold their hands (or sit quietly or whatever your chosen posture). The teacher says a prayer, one phrase at a time, and the children repeat after the teacher. Example: Teacher says, “Dear God” and the children repeat “Dear God”. Then the teacher says, “Thank you for this day” and the children repeat “Thank you for this day.” This continues for the entire prayer. Note: As the prayer goes around someone might not wish to pray for some reason. When their hand is squeezed they should just quietly squeeze to next hand in the circle so the prayer chain continues without a pause. The teacher begins the prayer and then each child prays thanking God for one thing before passing to the next person. The teacher begins the prayer and then each child prays for one person on the class prayer list. When it is a child’s turn to pray they can pray for the person on their left or right. Children (or the teacher) can write prayer topics on popsicle sticks and then put the sticks in a pail or cup. When it comes time in class to pray then the children can pull out one or more sticks and pray for those topics. Click here for more about prayer sticks. Thumb- (point to heart with thumb) Pray for those who are close to you. Index Finger- (point away from you) Pray for those who are far away. Middle Finger- (tallest of your fingers) Pray for leaders. Ring Finger- (only finger too weak to stand straight up) Pray for the weak. Little Finger- (least or could be the letter “I” in sign language) Pray for yourself last. Before prayer time ask the children to help you write prayer requests on pieces of paper. Divide the papers out so that each child has at least one request to pray for. Alternatively, ask for prayer requests from the children and you can pray for them. Older children are also able to write down requests and lead the prayer. Set up a tree branch in the classroom to represent a “prayer tree”. You might prop it in a bucket of rocks so it will stand up. You and the children can write prayer requests on papers and then peg them to the limbs of the tree. When it is time for prayer then you or the children take one of the papers and prays for the request on the paper. Simply write prayer requests on post-its and stick them on the wall or wherever you wish. At prayer time children can choose which prayer request to pray for. Provide children with paper and help them make their own personal booklet or journal. During the class prayer time they can add their own prayer reminders to their journal. Allow class time for them to silently pray for items in their journals. A simple prayer journal idea can be found at http://www.littleblots.com/BibleCraftsPrayerJournal.html. Write specific prayer requests on small rectangular slips of paper. Staple the ends of the papers together to form links of a chain. Connect the links to from a chain of prayer requests. The children can take these home and hang them somewhere in their room to help them remember what to pray for. Click here for more about prayer chains. Here are a few videos I’ve found about children praying. They really made me think so I thought I would share.